Aloha mai and welcome to the Kaua’i Fruit & Flower Company. The Island’s favorite source pre-packed tropical fruits, flowers and unique gifts filled with island treats! Locals also know Kauai Fruit & Flower Company as the “Pineapple Store” for Take home Boxes of Approved Kaua’i grown pineapples, papaya’s and gift boxes of tropical flowers and leis. The Kaua’i Fruit & Flower is located 3 minutes away from the Lihu’e Airport on Highway 56! It’s nestled between once verdant cane fields that today is open ranch lands at the base of Kalepa ridge on Kaua’i’s east shore. Native Hawaiians that lived in the surrounding area would share and trade their harvest from the uplands and fresh catch from the surrounding oceans near Hanamaulu Bay. In the early part of the last century the Lihue Plantation Company was mainly responsible for the existence of the building at the current location. In the early 1950’s, construction of the wood mill and wood shop were built – thus a legacy was born. The plantation style building would continue operating into the late 1980’s as the only Native Hawaiian operated manufacture of Hawaiian wood products and small furniture. 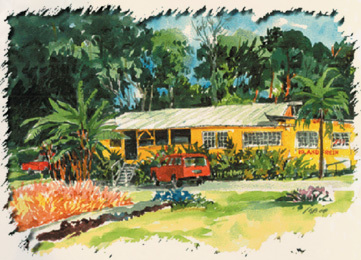 The original store was named “the Old Hardwood Factory.” Creating classic unique wood products, calabash bowls, platters, Hawaiian umeke and other house wear. All hand designed and harvested from Kauai’s forest. The store continued operating over the decades in various formats but still under the original families until the early 1990’s. Family members had moved on while others retired and the torch was passed to the next generation. Since the 1990’s they’ve continued the operation as the Kaua’i Fruit & Flower Company. With the Spirit of Aloha, they’ve embraced the economic changes that brought about new challenges and continued to press forward. They say remembering their rich heritage and Na Kupuna (elders) helps keep things in perspective. In 2000 they were awarded the Small Business of the Year by the State of Hawaii for their advocacy and support of the intellectually disabled. This achievement made possible through their long commitment for work opportunity and job training for the disabled. It’s what they’ve always done and continue as advocates in the Kauai Business community to hire and train disabled Adults with work opportunity, it’s Pono! Our good fortune is all because of the hard working staff, suppliers, growers, and loyal customers. From the ‘Ohana at the Kaua’i Fruit & Flower Company, Mahalo for shopping with us and your shared Aloha of Hawaiian fruits, flowers and all things Kaua’i!